HOW ABOUT VITAMIN C? DOES IT REALLY PREVENT COLDS? And should you really ‘feed a cold and starve a fever’? 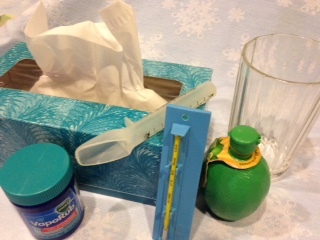 SEVEN “OLD WIVES TALES” THAT REALLY DO HELP FIGHT COLDS AND SORE THROATS! But to the point – I have a cold, or the flu or a virus or something, and I have been keeping it at bay with some supplements and herbal remedies — so I testify that Vitamin C and the apple really do work. They are part of a great line of first defense home remedies — things you probably already have in your medicine cabinet. But why do they work? And How Much do we need? I don’t want you to have to take my empirical evidence for the answer, so I asked Anat Raz, board certified herbalist and acupuncturist: http://www.anatrazacupuncture.com. And boy is she helpful — not only in steering me through the cold/flu season but also sharing her wealth of knowledge as to how to make sure you are getting your money’s worth out of vitamins and not, quite literally (!) flushing it away! 2. Vitamin C – Take 500 mg every 2&1/2 to 3 hours. Don’t take more in a single dose – or you may be running to the bathroom! A packet of EmergenC has too much for one dosage – 1,000 mg, so your body just eliminates the rest. (It also contains sugar — but that is a whole other blog!) So take half a packet, if you do not have any Vitamin C pills handy. If you do get the runs, even with the 500mg dose, just wait longer in between doses. 3. Vitamin D – This is another vitamin you probably already have in your medicine cabinet since the latest buzz is that most Americans suffer from a lack of Vitamin D. This vitamin, like Vitamin C is a good boost to your immune system, bolstering up your natural defenses to help you fight whatever bug you picked up. The herbalist, Anat advises that the dosage can range from 400 to 2,00 IU a day. 4. Chicken Noodle Soup – It really works! Something about the chicken broth, Anat Raz explained to me, actually works to reduce the amount of mucus in your throat to help with those pesky cold symptoms. So warm it up and start slurping! 6. Get Plenty of Rest – how many times did you hear your mother tell you that? Sleep is the way our bodies recuperate. We always need the proper amount of sleep to rejuvenate our cells and have energy to live our lives, but when you have a cold or a sore throat, sleep gives the body a chance to regenerate healthy cells. 7. AND DON’T QUIT UNTIL YOU FEEL COMPLETELY BETTER. One final word of advise from Anat is that most people, at the first sign of feeling better, resume their old eating habits and schedule, causing the cold or the scratchy throat to linger, which means either another round of treatment and anti-biotics, depending on your doctor and the cause of the ailment, or a cold that migrates to your lungs or your sinuses and causes more inflammation. January 27, 2015 in Body, Environment, Health. I do not recommend chicken noodles soup bur rather home made chicken vegetable soup. The reason is that the noodles, however tasty, will be contributing to the phlegm which we are trying to dispel. But any kind of vegetables is a great addition to the soup, carrots, celery, onion, cabbage, and any other root vegetables. If we would like to add greens like kale and spinach it should be added in the last 5 min as to not loose too much of the nutritional value. Parsley can be added when the stove is turned off. In term of vitamin c, most people will not have loose stools up to 6,000 mg of Vitamin C or even more. But some are sensitive so I thought it is worth mentioning. The individuals who are sensitive can take Ester C which is more gentle on the digestive system. The EmergenC packets are fine to use because they also contain some electrolytes, but either a half a packet at a time every few hours or pouring the packet into a large cup or a water bottle to sip over an hour are the best ways to take this medicine.